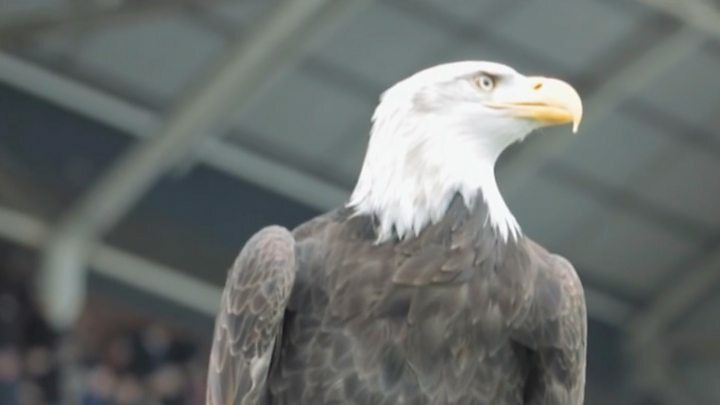 Kayla the Eagle: Who is Crystal Palace's mascot? A man has been convicted of trying to attack Crystal Palace's bald eagle mascot Kayla. But the 2015 incident involving Charlton Athletic supporter Daniel Boylett is just one of several in the bird of prey's colourful life. Stolen from a nest in Canada as a chick she has been the Crystal Palace club mascot since 2010 - and has even been credited with saving the Kent bird sanctuary where she lives. As well as flying around Palace's Selhurst Park ground before matches, she once appeared on the cover of a Kings of Leon album. "It's amazing how far she's come, for a bird that shouldn't be here," says Nicky Hopkins, from Eagle Heights Wildlife Foundation, in Eynsford, Kent. Kayla and her sister were stolen from the wild as chicks and reared poorly before being released back into the wild. Nineteen years ago, the sanctuary's founder Alan Ames received a phone call asking him to rehome the birds. "They said they had two psychotic bald eagles," he said. "They would pester humans to be fed because, having been hand-reared, they had no inherent fear. "I was told they would be put to sleep if I didn't take them. The paperwork took so long the sister got put to sleep. I went ballistic..
"Kayla had 30 days in quarantine and then we started training her up." Eagle Heights has about 100 birds of prey. It is open to the public, breeds birds and provides school visits, but Mr Ames is also often contacted by people in the entertainment world for help with projects. Kayla was photographed for the UK cover of the 2008 Kings of Leon album 'Only by the Night'. "We took her to a studio. We showed the band how to hold her. It was just another day in the office," says Mr Ames. Kayla has also been used as a standby on film sets including Clash of the Titans. Then in 2009, Mr Ames was approached by a Crystal Palace FC employee who lived close to his sanctuary. Kayla was invited to appear at a few home matches, later becoming the official mascot of the team - who are nicknamed The Eagles. A club spokeswoman said she was an "instant success" and is "extremely popular with fans". On home match days, she spends an hour outside the ground before being brought inside where she flies from one end of the stadium to the other before the match and at half-time. "She will fly into the stands. She flies right in between the players and cheerleaders. They love her," adds Mr Ames. "As far as the Palace fans are concerned, that's their eagle. It's something that Millwall haven't got," he adds, referring to the long-standing rivalry between the clubs. Although rival fans often sing derisory chants comparing Kayla to a pigeon, she has been known to stand up for herself. "She did nick a pork pie off a Millwall fan once," Mr Ames adds. Arguably Kayla's most significant achievement has been helping save the sanctuary that had rescued her 19 years ago. "We were in dire straits in 2015," says Ms Hopkins. "There was a chance we were going to have to close. "The Palace fans kept us open. It was down to them and their love for Kayla." Fans donated £15,000 to the centre, which helped keep it afloat. Mr Ames said she had "met many hundreds of thousands of fans" over the years before September 2015 when she was attacked. "If he'd hit her in the skull he could have killed her," he said. "She could have opened him right up if he'd got her in the face. [Her claws] can squeeze five times harder than a hand. She's designed to pierce thick fish skin." He said the incident had not caused her any ill effects, though, and she had continued to attend matches. "We're more aware now there can be people as stupid as this," Mr Ames said. "We realise we have to keep our eyes open." What does the future hold for Kayla? "She could live for 60 years," he says. "She'll probably outlive me."